Tingling in upper left arm which continues needs a professional examination. Off and on for about a year now I have felt this tingling in my left upper arm, and sometimes in the lower left part. If I move my arm it usually goes away, but if it's in certain positions or when I am crocheting it tingles most. Then I can move it or hold it up and it goes away until I go back to the position. Should I be worried this is a heart condition or is this some kind of nerve thing? It doesn't have any pain, it's just annoying when it happens. It gives me the chills sometimes. It doesn't sound like a heart condition, but are there any indications? Are your blood pressure and cholesterol within normal limits, is your weight reasonable, and do you have a family history of heart disease? These are reasons to have your medical doctor check you out. You make no mention of neck pain, so I presume that turning your head to the left and looking up doesn't hurt. Right? Next, do the "upper limb tension test" with the help of a partner. Is it positive? Yes, frankly you should be worried. Tingling like that which goes on requires a careful and thorough examination. It's probably related to your neck or the "thoracic outlet". 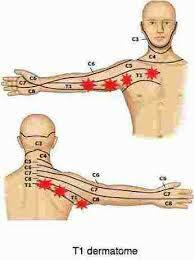 Try to define exactly where in your upper arm the tingling is worst. The C5 nerve root supplies the outer side, T1 the inner. Does raising your arm above your head, as in hanging the washing increase, or decrease the tingling?